The tech world’s just digging in to Google TV, now that Sony’s units are in the limelight. But one fact is glaringly obvious from the unit’s remote: This is not a unit for your Granny. Or possibly your parents. And that might be Google TV’s undoing. Sony’s Google TV offerings have now had an official launch, and surprisingly they’re actually cheaper than we’d feared: The 24-inch NSX-24GT1 is at the bottom of the range at $600, while the 46-inch 46GT1 rocks in at $1,400–about $500 less than we’d originally heard. There’s also the NSZ-GT1 which offers everyone with their own existing HDTV a way to add in Google TV through an integrated Blu-ray player, which costs a relatively groovy $400. Sony gets a tick in the “trying hard” box with these prices–they’re pretty competitive, considering the units are far more than a dumb, un-Net-connected TV, though they are still high enough that many users may be dissuaded from joining the Google TV revolution, especially when you add on paid services like Netflix. Early reviews are even pretty positive, though there’s some mention of lagginess in the responses to commands, possibly sourced in the underpowered Intel Atom chip providing the computing horsepower behind it all. 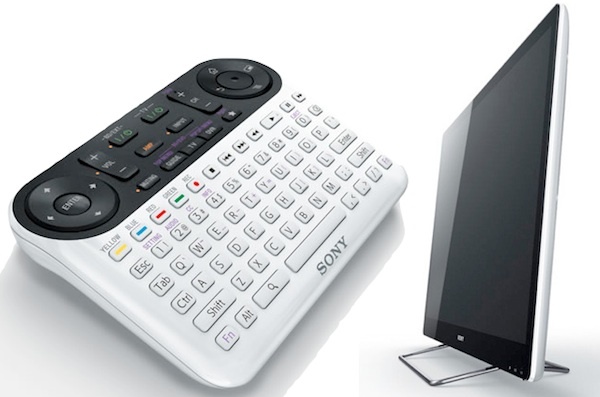 But Sony may have inadvertently exposed one of Google TV’s weaknesses: Check out the honkin’ remote control unit! It has 88 separate controls, just 17 short of a standard IBM 105-key PC keyboard. It’s understandable, given that the Google TV is essentially a tiny computer, and you may need to enter text into password boxes and the like. But to your Gran, that shiny white Sony monster will loom larger in her mind than the TV itself, thanks to the “shifts” the “alts” and the “fns” and those pesky “ctrls.” It’ll seem like the flight deck of Concorde, or the bridge of the starship Enterprise. And remember all those rows with your parents about programing the video recorder (and now the DVD recorder?). They just got a whole lot worse. Of course techno-geeks will love, adore, nay swoon over it…but think of those sofa-side rows with one’s better half over “who gets the remote.” They’re way more dangerous now the remote is a weapon fit to inflict serious head-wounds. Of course, we jest. Google TV is pretty sophisticated, and a complex remote may be warranted. But what this gadget does do is highlight the relative complexity of Google’s approach versus Apple’s super-slick Apple TV, with its pared-down UI and mere 7-button remote–and even Roku’s simpler set-top unit. Consumers pay attention to this sort of detail, Sony.